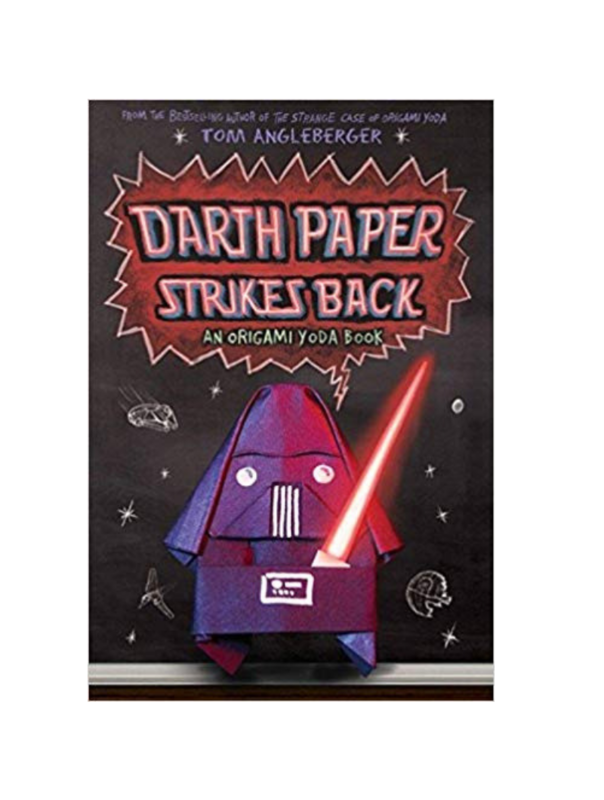 Darth Paper Strikes Back is the second in Tom Angleberger’s Star Wars related children’s books, following on from The Strange Case of Origami Yoda. These books are aimed at children of about 8-11 years old. Although this book has loose connections and the same characters as the first book, you can easily enjoy this one as a completely separate story. I have not read the first one but after uneasily getting through the first couple of pages, I really enjoyed this unique children’s book. The first page includes the word ‘like’ a disturbing amount of times and the little sketches and doodling all over the place are a little distracting to begin with (although I am presuming this would be found far more appealing by the children it is aimed at). But as soon as I got used to the style and format, I completely and utterly fell for this surreal story of friendship and a paper problem solver. Most of this book is written from the perspective of Tommy, a seventh-grade schoolboy. When Tommy discovers his best friends, Dwight, might be sent to a correctional and remedial education facility he gathers the rest of his friends together to save him. Dwight is, simply put, the agony aunt of the school. Via a little paper origami Yoda, worn on his finger, he expertly advises them on their problems and makes scarily accurate predictions. But of course, where there’s a goodie, there’s always a baddie. This comes in the form of Harvey, a classmate of Tommy and Dwight’s who decided to create an origami Darth Vader to bring down origami Yoda and attempt to undermine his status within the school. As Dwight is suspended for his unusual finger puppet based behaviour, Tommy and his other classmates’ band together to create a case file of incidents to hand over to the school board in an attempt to convince them that Dwight and Yoda are much loved, needed and respected. Although, when Harvey and Darth Paper hear about Tommy’s plans, the Dark Side does its best to throw a spanner in the works. And in case you were wondering, this book isn’t just for Star Wars fans either. If you are a fan then you’ll appreciate a few more of the references and quotes but as long as you get the gist that Yoda equates good and Darth Vader is bad, that’s all you need to know to fully enjoy this read. This is the most beautifully surreal story I have read in a long time and I love how the author has captured children’s open-mindedness to situations adults would consider ridiculous. I have read quite a few reasonably serious children’s books lately (Morpurgo etc.) and although I adore them, I found it really refreshing to read something so completely aimed at simple entertainment. I can also see this book appealing to kids who are slightly more reluctant readers or struggle with concentration as the chapters are brief and the case files the classmates make, create a collection of short stories in themselves. Will Dwight be sent to reform school? Is Origami Yoda real? Will Darth Paper and the dark side really win? Well, I’m not saying, you’ll just have to read it and find out! If you like Darth Paper Strikes Back you’ll love Who Could That Be at This Hour? by Lemony Snicket.